For the Waterhouse painting, see The Lady of Shalott (painting). "Shalott" redirects here. For other uses, see Shalott (disambiguation). "The Lady of Shalott" is a ballad by the English poet Alfred, Lord Tennyson (1809–1892). Like his other early poems – "Sir Lancelot and Queen Guinevere", and "Galahad" – the poem recasts Arthurian subject matter loosely based on medieval sources. Tennyson wrote two versions of the poem, one published in 1833, of 20 stanzas, the other in 1842, of 19 stanzas. The poem is loosely based on the Arthurian legend of Elaine of Astolat, as recounted in a thirteenth-century Italian novella titled Donna di Scalotta (No. LXXXII in the collection Cento Novelle Antiche); the earlier version is closer to the source material than the latter. Tennyson focused on the Lady's "isolation in the tower and her decision to participate in the living world, two subjects not even mentioned in Donna di Scalotta." The first four stanzas of the 1842 poem describe a pastoral setting. The Lady of Shalott lives in an island castle in a river which flows to Camelot, but the local farmers know little about her. Stanzas five to eight describe the lady's life. She suffers from a mysterious curse and must continually weave images on her loom without ever looking directly out at the world. Instead, she looks into a mirror, which reflects the busy road and the people of Camelot who pass by her island. The reflected images are described as "shadows of the world", a metaphor that makes it clear they are a poor substitute for seeing directly ("I am half-sick of shadows"). Stanzas nine to twelve describe "bold Sir Lancelot" as he rides by and is seen by the lady. The remaining seven stanzas describe the effect on the lady of seeing Lancelot; she stops weaving and looks out of her window toward Camelot, bringing about the curse. According to scholar Anne Zanzucchi, "in a more general sense, it is fair to say that the pre-Raphaelite fascination with Arthuriana is traceable to Tennyson's work". Tennyson's biographer Leonée Ormonde finds the Arthurian material is "Introduced as a valid setting for the study of the artist and the dangers of personal isolation". Feminist critics see the poem as concerned with issues of women's sexuality and their place in the Victorian world. Critics argue that "The Lady of Shalott" centers around the temptation of sexuality and her innocence preserved by death. Christine Poulson discusses a feminist viewpoint and suggests: "the Lady of Shalott's escape from her tower as an act of defiance, a symbol of female empowerment...". Based on Poulson's view, escaping from the tower allows for the Lady of Shalott to emotionally break free and come into terms with female sexuality. The depiction of death has also been interpreted as sleep. Critic Christine Poulson says that sleep has a connotation of physical abandonment and vulnerability, which can either suggest sexual fulfillment or be a metaphor for virginity. Fairytales, such as Sleeping Beauty or Snow White, have traditionally depended upon this association. 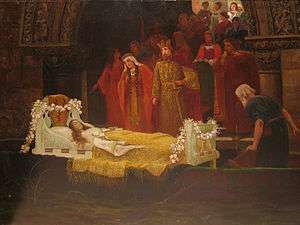 So, as related to the Lady of Shalott, Poulson says: "for in death [she] has become a Sleeping Beauty who can never be wakened, symbols of perfect feminine passivity." Critics such as Hatfield have suggested that The Lady of Shalott is a representation of how Tennyson viewed society; the distance at which other people are in the lady's eyes is symbolic of the distance he feels from society. The fact that she sees them only reflected through a mirror signifies the way in which Shalott and Tennyson see the world———in a filtered sense. This distance is therefore linked to the artistic license Tennyson often wrote about. The poem was particularly popular amongst artists of the Pre-Raphaelite movement, who shared Tennyson's interest in Arthuriana; several of the Pre-Raphaelite Brotherhood made paintings based on episodes from the poem. Two aspects, in particular, of "The Lady of Shalott" intrigued these artists: the idea of the lady trapped in her tower and the dying girl floating down the river towards Camelot. In Moxon's 1857 edition of Tennyson's works illustrated by William Holman Hunt and Dante Gabriel Rossetti, Hunt depicted the moment when the Lady turns to see Lancelot. In the background of the illustration, Hunt juxtaposes the window facing Lancelot with a painting of Christ's crucifixion. According to Christine Poulson, the Crucifixion is the archetype of self-sacrifice and further emphasizes the ideal that the Lady of Shalott fails to represent. Poulson also considers this representation of the subject in the context of changing women's roles in the 1880s and 1890s, suggesting that it served as a warning of imminent death to women who stepped from their restricted roles and explored their desires. Rossetti depicted Lancelot's contemplation of the Lady's "lovely face". Neither illustration pleased Tennyson, who took Hunt to task for depicting the Lady caught in the threads of her tapestry, something which is not described in the poem. Hunt explained that he wanted to sum up the whole poem in a single image, and that the entrapment by the threads suggested her "weird fate". The scene fascinated Hunt, who returned to the composition at points throughout his life and finally painted a large scale version shortly before his death. He required assistants, as he was too frail to complete it himself. This deeply conceived evocation of the Lady, ensnared within the perfect rounds of her woven reality, is an apt illustration of the mythology of the weaving arts. This work is now in the collection of the Wadsworth Atheneum Museum of Art in Hartford, Connecticut. John William Waterhouse painted three episodes from the poem. In 1888, he painted the Lady setting out for Camelot in her boat; this work is now in the Tate Gallery. In 1894, Waterhouse painted the Lady at the climactic moment when she turns to look at Lancelot in the window; this work is now in the City Art Gallery in Leeds. Poulson argues that Waterhouse's impressionistic painting style in his 1894 rendering of The Lady of Shalott evokes a "sense of vitality and urgency". In 1915, Waterhouse painted "I Am Half-Sick of Shadows," Said the Lady of Shalott, as she sits wistfully before her loom; this work is now in the Art Gallery of Ontario. The poem is alluded to in Oscar Wilde's novel The Picture of Dorian Gray (1890), when Sibyl Vane says, "I have grown sick of shadows." The Lady of Shallot is mentioned in Annie Fellows Johnston's "Three Weavers", a fairy tale embedded in chapter XIV of the children's book The Little Colonel at Boarding-School (1903). Nancy Mitford referenced the Lady of Shalott in her novel Love in a Cold Climate (1949). A character in Eric Frank Russell's novel Next of Kin (1959) quotes the poem. Miss Jean Brodie, in Muriel Spark's novel The Prime of Miss Jean Brodie (1961), reads the poem out loud to her class. Agatha Christie used the line, "The mirror crack'd from side to side", to title her novel The Mirror Crack'd from Side to Side (1962), and the poem plays a large part in the plot. The Lady of Shalott is referenced several times in Bel Kaufman's novel Up the Down Staircase (1965), particularly in the episode involving Alice Blake's suicide attempt. Jessica Anderson uses the line "'Tirra lirra,' by the river" to title her novel Tirra Lirra by the River (1978). Sharyn McCrumb's first published novel was a murder mystery titled Sick Of Shadows (1984). Robin Klein uses the line "All in the blue unclouded weather" to title her short story collection All in the Blue Unclouded Weather (1991). In Diana Wynne Jones' novel Hexwood (1993) one of the main characters, Ann Stavely, compares herself to the Lady of Shalott in that she uses a mirror to look outside her window. In the title of her short story "Save the Reaper" (1998), Alice Munro alludes to the ballad's lines, "Only the reapers, reaping early", and "And by the moon the reaper weary", respectively. Patricia A. McKillip uses an adaptation of the poem as a primary theme of her novel The Tower at Stony Wood (2000). The poem is discussed and quoted in Libba Bray's novel A Great and Terrible Beauty (2003). A stanza is located at the beginning of each chapter in Meg Cabot's novel Avalon High (2005). The poem is referenced in Jilly Cooper's novel Wicked! (2006), where the phrase The curse is upon me is given a humorous re-interpretation in an English Literature class scene. Lisa Ann Sandell's novel Song of the Sparrow (2007) is a retelling of her story. Tennyson's poem is used for narration and as a narrative device in the short story "Camelot Garden" (2008), by manga author Kaori Yuki. In Chapter 25 of Elly Griffiths' novel The House at Sea's End (2010), Jack Hastings "says something to Nelson and Nelson laughs, the sound echoing up to Ruth's turret window. She retreats. She doesn't want them seeing her there, like some overweight Lady of Shallot." Alan C. Bradley uses the line "I am half-sick of shadows" to title his book I Am Half-Sick of Shadows (2011). In Jasper Fforde's novel One of our Thursdays Is Missing (2011), the Lady of Shalott possesses a mirror that allows characters in the Book World to see into the real world ("the Outland"). Sarah Gridley's poetry collection, Loom (2013), is heavily influenced by The Lady of Shalott. The first musical setting of the poem was probably a work for mezzo-soprano soloist, chorus and orchestra by the English composer Cyril Rootham, composed in 1909–10. The only known performance of Rootham's op 33 The Lady of Shalott was given in the School Hall at Eton College on 18 September 1999, with the Broadheath Singers and the Windsor Sinfonia conducted by Robert Tucker. In 1946 Phyllis Tate composed a setting of Tennyson’s The Lady of Shalott, written for the 10th anniversary of the BBC Third Programme. In 1957-58 Arthur Bliss (once a pupil of Cyril Rootham, above) composed a 40-minute ballet suite titled The Lady of Shalott. Popular folk duo the Indigo Girls reference the Lady of Shalott in the song "Left Me a Fool" (first released on their 1987 album Strange Fire). Lamenting the lack of depth and substance she finds when getting to know a beautiful lover, the singer sings "you remind me of Shalott, only made of shadows, even though you're not." Composer Jon Parr Vijinski wrote a symphonic tone poem entitled The Lady of Shalott (2001). His use of thematic material, complex harmonies, and rich orchestral colour seek to link the story to its mediaeval source, and the spirit of chivalry – such as de Troyes, von Eschenbach and Malory. Israeli progressive rock group "Atmosphera", recorded a 16-minute epic named "Lady of Shalott" about the ballad. the recording was never released until 2002 on the band's only album which was recorded in the 70s. Dutch gothic metal band Autumn also reference the Lady of Shalott in the songs "Who Has Seen Her Wave Her Hand", "Mirrors Magic Sights", "When Lust Evokes the Curse", "Floating Towards Distress" and, arguably "Behind the Walls of Her Desire" from their 2002 album When Lust Evokes the Curse. Each song retelling parts of the story from the poem. The song titled "Shalott" on Emilie Autumn's 2006 album Opheliac tells the poem from her own perspective, where she quotes the Lady of Shalott as saying "But then, I could have guessed it all along, 'cause now some drama queen is gonna write a song for me." She uses imagery from the poem, and quotes it directly: "I'm half sick of shadows". Swedish pop band The Cardigans reference the poem with the line 'Mirror cracked from side to side' in a bonus track on the UK edition of Super Extra Gravity, entitled 'Give Me Your Eyes'. The Lady of Shalott is featured on the Seven of Mirrors tarot card in the Chrysalis Tarot deck. In the 1985 television adaptation of Lucy Maud Montgomery's Anne of Green Gables, Anne Shirley reads various stanzas of the poem and acts out the Lady of Shalott's tragic end as she floats down the river; lines from Tennyson's "Lancelot and Elaine" are also referenced. In the book, the poem enacted is consistently "Lancelot and Elaine". In Episode one of the 1995 BBC production of The Buccaneers, Laura Testvalley (Cheire Lunghi) reads part of it to Annabel St. George (Carla Gugino). 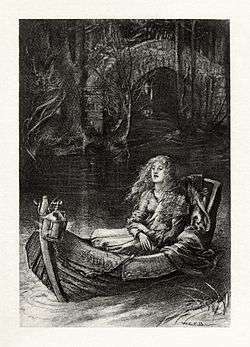 "The Lady of Shalott" does not appear on the original book by Edith Wharton. In the ITV series Lewis (Inspector Lewis in the US), episode titled "Old, Unhappy, Far Off Things" (2011), D.S. Hathaway quotes the line "Out flew the web and floated wide". This poem forms the backbone of voice-over for the episode "Tracie's Story" (2012) from BBC1 Drama Accused starring Sean Bean as a transgender woman in a highly destructive relationship with a married man. In the ITV series Endeavour, the eponymous Endeavour Morse is heard reading part of the poem aloud in "Girl" (2013). In V for Vendetta (2005), Waterhouse's painting appears in V's gallery along other masterpieces. ↑ Potwin, L.S. (December 1902). "The Source of Tennyson's The Lady of Shalott". Modern Language Notes. Modern Language Notes, Vol. 17, No. 8. 17 (8): 237–239. doi:10.2307/2917812. JSTOR 2917812. 1 2 Zanzucchi, Anne. "The Camelot Project at the University of Rochester: Alfred Lord Tennyson". Retrieved 10 January 2008. ↑ Brownbridge, Joshua (2016). "The Lady of Shalott is an allegory for female oppression in the Victorian era and serves as Tennyson's argument against the established gender roles.". 1 2 3 4 5 Poulson, Christine. Death and the Maiden: The Lady of Shalott and the Pre-Raphaelites. pp. 173–194. ↑ Poulson, Christine (1995). Reframing the Pre-Raphaelites. Aldershot, England: Scolar Press. p. 173. ↑ Poulson, Christine. "Death and the Maiden: The Lady of Shalott and the Pre-Raphaelites". Reframing the Pre-Raphaelites: 183. ↑ Fellows Johnston, Annie (1903). The Little Colonel at Boarding-School. ↑ Mitford, Nancy (1954). Love in a Cold Climate (Print ed.). London: Penguin Books. p. 138. ↑ Spark, Muriel (1961). The Prime of Miss Jean Brodie (Print ed.). London: MacMillan and Company Limited. pp. 4, 23–24. ↑ McCrumb, Sharyn (1984). Sick of Shadows. Avon Books. ISBN 978-0-380-87189-6. ↑ Duncan,Isla Duncan (2011). Alice Munro's Narrative Art (ebook ed.). New York: Palgrave Macmillan. pp. 85–86. ISBN 978-1-137-00068-2. ↑ "Kaori Yuki Creates Camelot Garden One-Shot Manga". Anime News Network. January 28, 2008. Retrieved March 1, 2009. ↑ Griffiths, Elly (2010). The House at Sea’s End. Quercus Publishing. ISBN 978-1849163675. ↑ Gridley, Sarah (2013). Loom. ↑ The Band Perry (2010). "If I Die Young". YouTube. Republic Nashville Records. ↑ "The Ravens, Half Sick of Shadows". Chrysalis Tarot. April 2014. Anne Zanzucchi, "Alfred Lord Tennyson"
The Lady of Shalott film adaptation by WAG Screen. The Lady of Shalott set to music From the 1990 concept album "Tyger and Other Tales"
"La dama di Shalott nella traduzione di Gabriella Rouf." (PDF) (in Italian). Il Covile. 2010. Retrieved 25 February 2013.